February 23, 2016 by iCepts Technology Group, Inc.
Microsoft Dynamics NAV 2016 has been released with many new features in Enterprise Functionality for Small to Mid-Sized Wholesale Distribution and Manufacturing companies. A terrific business productivity feature is a tight integration with Microsoft Dynamics CRM and Microsoft Dynamics NAV 2016 Enterprise Solution. When using Microsoft Dynamics CRM for customer engagement and Microsoft Dynamics NAV for order processing and financials, a direct CRM connection enables an optimal and seamless experience in the lead-to-cash process. Because of this tight integration between Microsoft Dynamics CRM accounts and Microsoft Dynamics NAV customers, users can work more efficiently by using cross-product features. Microsoft Dynamics CRM integration enables you to couple Microsoft Dynamics CRM records with Microsoft Dynamics NAV records - essentially linking the records together. Once coupled, you can access Microsoft Dynamics CRM records from Microsoft Dynamics NAV and, for some entities, access Microsoft Dynamics NAV records from Microsoft Dynamics CRM. You can also synchronize data between records so that data is the same in both systems. 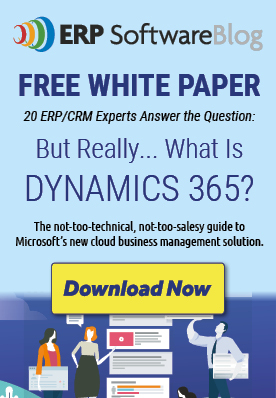 Microsoft Dynamics NAV 2016’s technology has introduced a new feature called Dynamics CRM Integration. It enables an optimal and seamless experience for our customers in the lead to cash process when they are utilizing Dynamics CRM for customer engagement and Dynamics NAV for Order processing and financials.